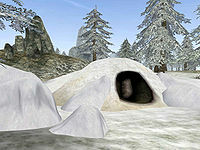 Kjolver's Dwelling is a small dwelling located between Brodir Grove and the Cave of Hidden Music. This small ice cave is the primitive home of Kjolver. The upset woman has had enough of her husband Brandr's infidelity, and she is willing to take drastic measures. On a small wooden plateau is her bedroll, table, chairs, and an ancient wooden chest containing gold and a silver longsword. Barrels hold minor ingredients. This page was last modified on 12 July 2013, at 17:56.